I don't post a lot and tried to do my due diligence and look at the threads before posting. I have one of the throwback Grant jerseys. Just curious if anyone knows if they are going to wear an orange version on the road? They came out against Louisville and I thought it was a one time thing but now it seems they have worn them at home since. Anyone? Anyone? I think you are correct that it was originally to be a one-tine thing in New York. However, the popularity of that particular look seemed to take off. I have heard nothing definitive about an away version of the uniform, though it would be cool to have one for the postseason. You are correct it was a one off to celebrate Ernie and Bernard in New York and maybe for a game or two but the fans and players love it so much they made it the home uniform for the season. 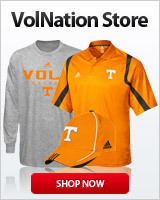 "He hit the X Button"
Light blue trim on the letters and numerals takes us to total Rocky Top Nirvana. I really don’t want a gray version. I think we’re past that phase. If we keep winning and get that all-important one seed in the tournament, we won't need an "away version" of those uniforms. These are Allan Houston era. Ernie and Bernie had baby blue trim. And the hype video for these showed all Allan Houston highlights. We had some baby blue trimmed throwbacks in Pearl’s first year, both home and away. And I don’t think we did well in them. I know we got destroyed at Alabama in the orange ones in 2006. Beat Florida at their place in them to win the East. They certainly need these back........if they want to do throw backs............definitely with the blue trim. Also at least for the LSU game the short shorts as well. I got this several years ago. A vintage apparel company (29/34) made a bunch of cool retro jerseys.I don't know if they are still in biz or not, but this jersey is awesome. Pics dont do it justice, but its WAAAYY too huge for me to wear! Awesome!...I had been looking for one of those for a long time but never really found one at the right price so I had one made just a month ago. Where did you have it made and how much? Looks great! I'd love one that doesn't fit me like an enormous dress! Nice, and they stihed the nike check on there? Crazy! Did you give them special instructions? I might be willing to grab one up that fits me at that price.